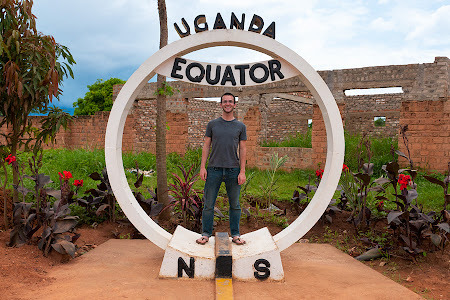 On Tuesday, we headed back to Uganda. After all the rain at our campground in Rwanda, everyone attempted to dry some of their clothes from the open sides of the truck. The breeze actually did a pretty decent job of drying my jeans. After five and a half hours, we reached the town of Kabale, where we stayed at a campground with a wonderfully flat yard perfect for pitching tents. We all immediately took advantage of the rare sunshine, rushed off the truck, and laid out our remaining wet clothes anywhere and everywhere we could find – barbed wire, on the truck, or just directly on the grass. We got a few hours of sunshine before the rains started again. Kabale is just an everyday city with no tourists whatsoever, so we walked over to a local store to buy some alcohol and juice for punch and just relaxed back at camp for the evening. After packing up our sopping tents in the pouring rain the next morning, we stopped at a fruit market in Kabale. The vendors only sell fruit in big bunches, so I went in with four other people for some bananas, passion fruit, and mango so we could make a fruit salad for lunch. A bunch of 16 fresh bananas only cost one dollar! After an hour and a half, we stopped in the town of Rukiga to buy some meat on a stick from vendors who swarmed around the back of the truck. It is a gamble as to what type of meat you might get and whether it is fresh and hot. Luckily, we got steak instead of liver. It was four hours further to our bush camp, which was situated on private farmland. 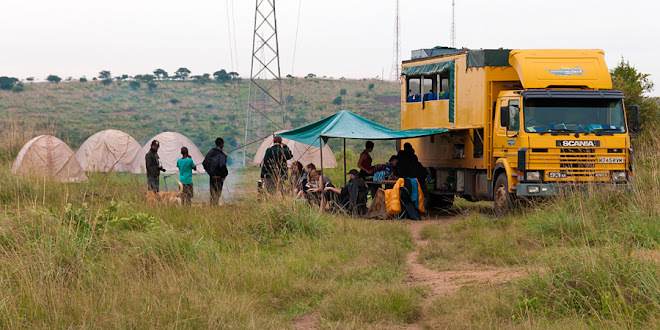 Oasis Overland sponsored the owner to attend school, and he lets Oasis groups camp on his land in return. We pitched our tents, avoiding the numerous piles of manure while swatting at the plague of flies that swarmed around the whole area. We sat around the campfire and watched ankole – also known as "devil cows" due to their massive horns – being herded as the sun set. The cook group stuffed fresh green peppers with mushrooms and rice, wrapped them in foil, and cooked them in the open fire for a scrumptious dinner. As usual, sweet chili sauce was the perfect accompaniment – our group has discovered that it goes with just about everything. As the only American, I introduced everyone to the tradition of s'mores. I was surprised that my English friends had never heard of roasting marshmallows over a campfire! Back in Kenya, I had searched five different stores for marshmallows, chocolate bars, and cookies (to substitute for graham crackers). In a quirky African twist on the tradition, I found a branch from an acacia tree and stuck about 15 marshmallows on the huge thorns for efficient roasting. Needless to say, the s'mores were a big hit. In the morning, the family brought us fresh milk directly from a cow for our tea. After breakfast, we headed towards the equator for lunch and shopping at some local craft stores. We also stopped at a banana-filled fruit market as well as a row of drum shops on our way to Kampala. I bought a huge drum that will make a cool end table. I paid $25, which I thought was a pretty good deal for an animal skin drum hand made in Uganda! We have a compartment on the truck where we can keep large souvenirs until we have a chance to ship them home. We arrived in Kampala in the afternoon and were able to finally freshen up after three days without access to a shower! Yesterday evening, we went out for a night on the town. An Irish bar was first, but it was packed with mzungus and very few locals, so Tim, a Ugandan guy who went out with us, took us to another bar. There was a fantastic live band that was performing reggae music. After a few hours, eight of us crammed into a taxi and headed for a nightclub. When we arrived, they wanted to charge us 25,000 Ugandan shillings each (about $13) to enter. Sybil, A black American woman who was living in Kampala, had tagged along with us from the bar. She was drunk and made a huge scene about us being charged higher prices then the locals. One guy in our group had managed to get in the nightclub for free before she started freaking out, and then the bouncers wouldn't let the rest of us in because we were with Sybil. We tried to explain that we weren't really with her, but things just weren't going to work out. Some people left at this point to go back to camp, but I stayed with three girls from our group. Sybil was just too entertaining – as long as we kept our distance from her. Tim stayed with us while she started screaming, crying, and even slapping at some of the bouncers. She threatened to call the cops because they were overcharging us, and then she finally climbed in a taxi, slammed the door, and was gone. Relieved to be rid of Sybil's drunken (but quite hilarious) antics, we walked down the street to a hole-in-the-wall place for some chips (or fries – being the only American in our group, I've found it easier to just start using British lingo). Tim helped us haggle for a taxi ride back to our campground, and we finally climbed into our tents at four in the morning. Thankfully, today is a free day. It has been raining all day and has turned out to be a very welcome break from our busy itinerary. The wireless internet here is a rare luxury in Africa, and I have been online all day catching up on everything. Now that I have some free time, I am also adding photos to some previous posts, so be sure to look at them! Of course, the internet is painfully slow – what has taken me three hours today would have taken maybe 20 minutes back in the States. Oh well, as the acronym famous throughout the continent goes, T.I.A. – This Is Africa! Matt, it's great. Keep up the good work and we're watching. Matt, your grandmother came over for dinner and i typed a message that she dictated using my "gmail" account. it will appear as though it's from me, but it's really from Barbara. i misspelled grandma and Barbara wished she'd used "grandmother" instead. we printed the entire blog for her to take home and read. 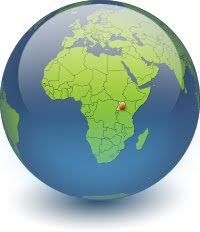 Matt, its great to know that they have fun clubs in the Ugandan outback. Nice pics, keep 'em coming!